Sometimes it takes trying new things in an unfamiliar situation to come together. Let us help you do that. Email contact@fallouttheater.com to plan a corporate workshop for your team, and read on for more info! This workshop is a crash-course through Fallout Conservatory’s sharpest and most fun team-building tools. At the start of a new work project, your team may be filled with doubt and self-judgement. This workshop is a series of exercises designed to force your team to think so quickly, they won’t have time to judge themselves or their ideas. 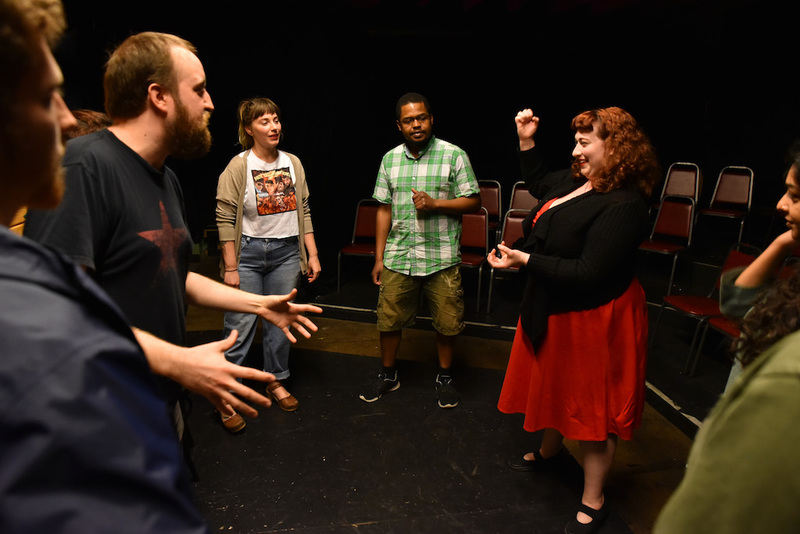 Using tried and true mind-melding games and scenes, your team will learn to jump into the conversation and dodge those pesky hurdles of self-loathing and hesitation like the best of any improv comedy pro. This workshop is a minimum of three hours and builds on the previous workshop’s ideas, but takes it a step further. With 30 minutes to go, the team will be split into two groups and each given 15 minutes to perform a real live improv show for their supportive peers, using exercises and confidence gained throughout the workshop. We recommend workshops last 2-3 hours, but can customize a program for your company. We charge $40 per participant and require a minimum of $640. Workshops can take place at your business or at Fallout Theater if you’re looking to for a change of scenery outside the office! Want to learn more? Email contact@fallouttheater.com to plan a corporate workshop for your team!